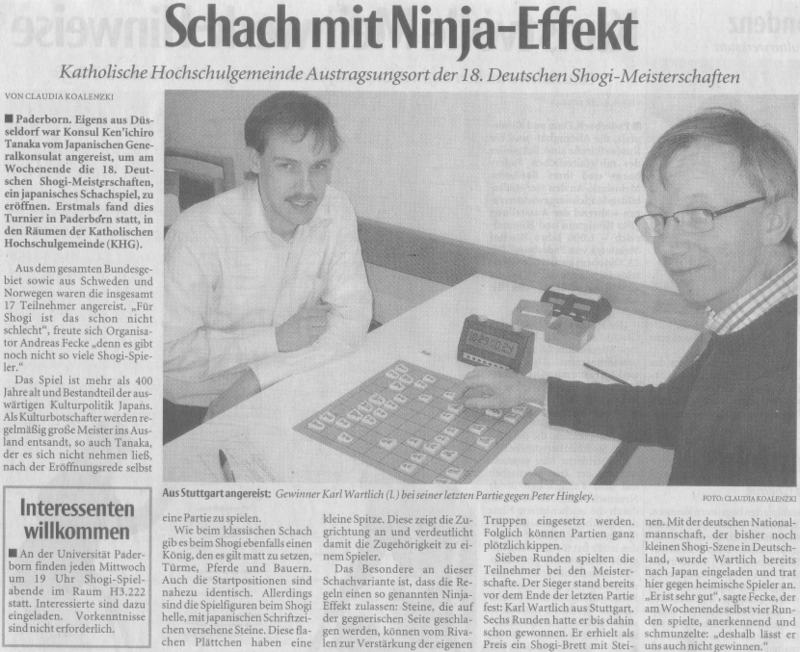 Here is the scanned-shot of the article in a local German newspaper reported that Consul Tanaka took part in the 18th German Shogi Open Championship. It has been sent by Dr. Gralla, one of my German friends. 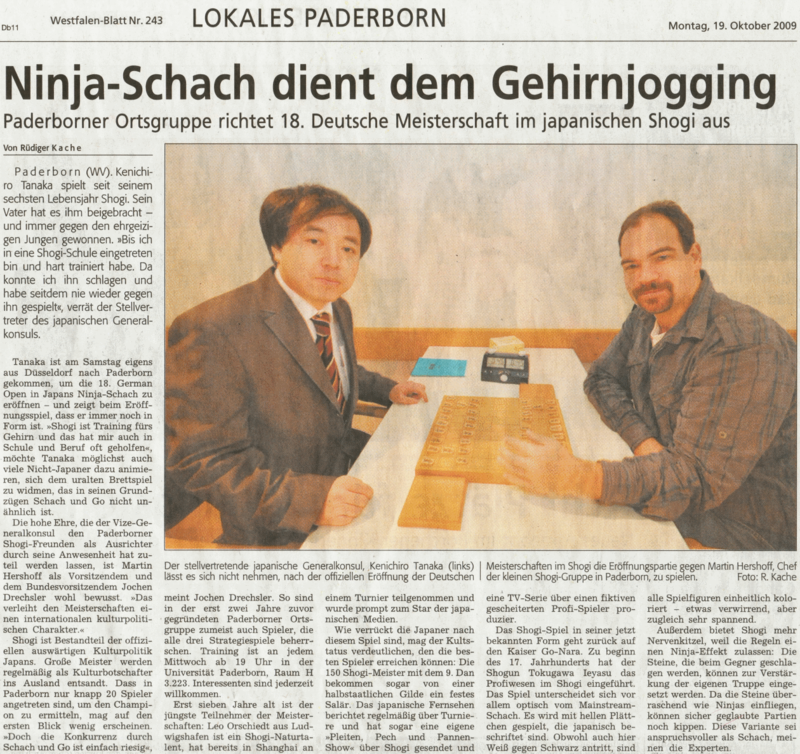 the 18th German Shogi Open at Paderborn on October 17th / October 18th, 2009 has been a milestone in the history of German Shogi since it has been the first time that the German Open has officially been opened by a representative of the Government of Japan. Consul Kenichiro Tanaka from Japan's General Consulate of Dusseldorf, the inofficial "Capital of Japan's Expatriates in Germany", has opened the 18th German Open at Paderborn. And Consul Tanaka has competed in the first round of the German Open as weell - and he won easily, in amazing 15 minutes! The result of Consul Tanaka's training during his youth: He has attended a school of Shogi in Japan. The local press has covered the event too, the "Westfalen-Blatt" has published a long feature about the event. In the annex I email the scan of that article to you. Thanks a lot, Dr. Gralla. It's good to know that Consul Tanaka attended the tournament. For those who are interested in the result of the championship, please refer to here. (in German) and click 18. Offenen Deutsche Meisterschaft. I found the price of "Let's Catch the Lion(Dobutsu Shogi)" in Essen Spiel in the following page. According to the page above, the boot of "Let's Catch the Lion" will be at 4-227. The special price for the exihibition will be at Euro12 pre unit. In addition, looking at the lowest photo of the linked page, some shogi sets seems to be sold there at Euro50. 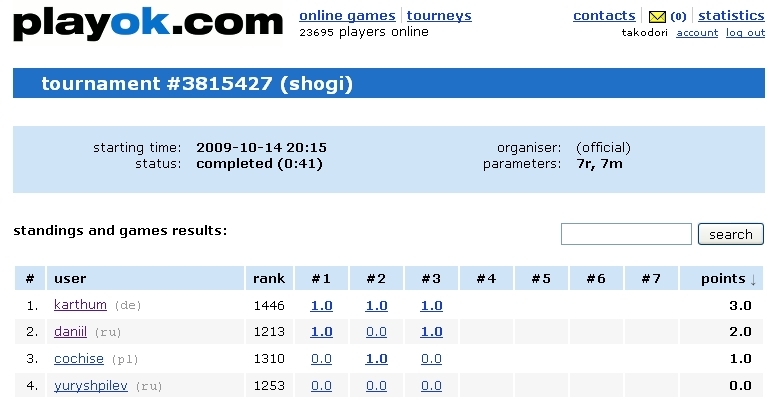 Nhkradio is the winner of the captioned on-line shogi tournament held on October 17, 2009. Here is the link to the result. 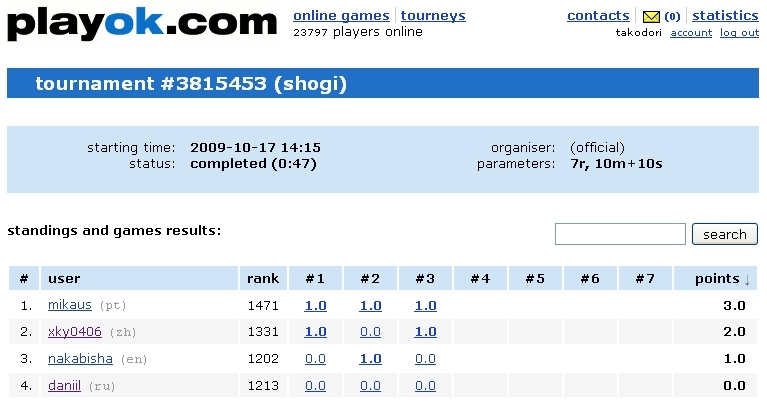 Mikaus is the winner of the captioned on-line shogi tournament held on October 17, 2009. Here is the link to the result. 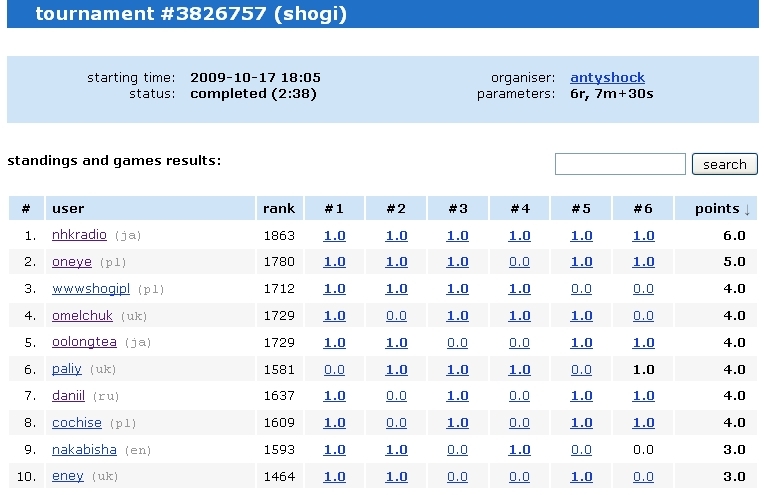 Karthum is the winner of the captioned on-line shogi tournament held on October 14, 2009. Here is the link to the result. The allotted thinking time per player is 8 hours and less than 60 seconds per move after consuming it. And gpsshogi_en and bonanza_shogi which are computer shogi programs are following this game to output their evaluation values and readings per every move. And frequently updating photos are available to look at. The allotted thinking time per player is 4 hours and less than 60 seconds per move after consuming it. Today is the day for the game of 3rd Mynavi Joshi Open between Nakamura Marika(Joryu 2 dan) and Kagawa Manao(Joryu 2 kyu). As a result of Furigoma, Nakamura became Sente. It started at 10:00 am in Japan. The allotted thinking time per player is 3 hours and less than 60 seconds per move(Ippun Shogi) after consuming it. Here are the links to the live boards. Today is the day for the second game of 40th King of Rookies-sen best of three match between Hirose Akihito(5 dan, 22 years old) and Nakamura Taichi(4 dan, 21 years old). The game started at 10:00am. Here are the links. Hirose is Sente in this game. The allotted thinking time per player is three hours and less than 60 seconds per move after consuming it. The official blog is in Japanese here. Both are professional players who are students of Waseda University. Nakamura is an AISEP member as well. The King of Rookies-sen U-26(Shinjinoh-sen Under 26) is the tournament which is limited to the professional players who is under 5 dan and 26 years old, Shoreikai 3 dan players with good performance, and Joryu(Ladies) profesional players under 26 years old.